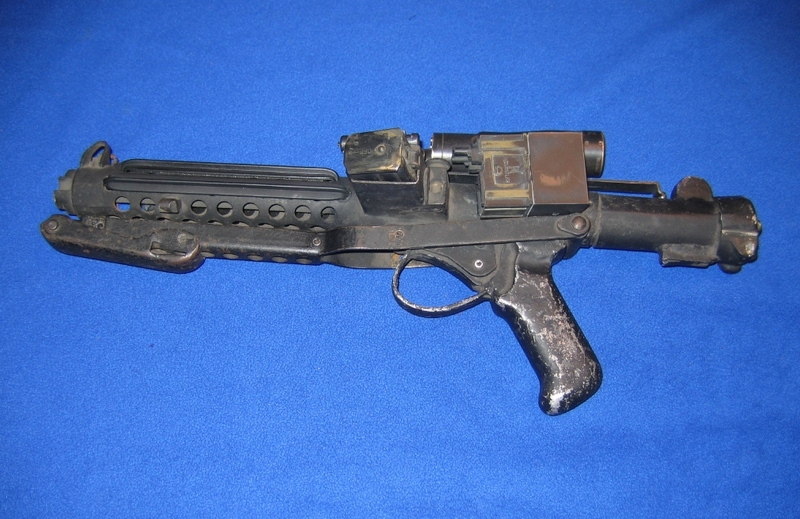 This is an original Stormtrooper blaster prop used in the production of Star Wars: A New Hope. This item was discovered among a set of other stormtrooper blaster props kept by one of the original armorers for the first two films. During that era, Lucasfilm rented many of their props, and upon completion of the projects, the items were returned to the armorers. These blasters were customized by the armorer exclusively for Star Wars by taking a standard Sterling sub-machine gun but modified to allow export by disabling the firing mechanism. Some of the custom features include the removal of the trigger, a custom grip, and a wooden dowel in place of the gun barrel. Replica counter box, scope, and barrel ribs have been added to restore the piece to its original state used onscreen as some of these additions were lost from the original filming.